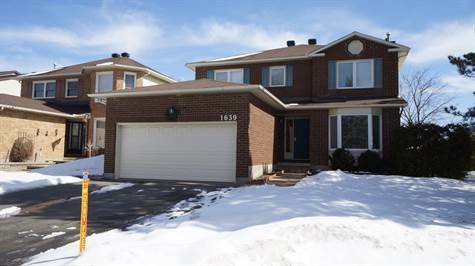 SOLD $449,900 Excellent location in Chateauneuf! "Desirable Corner lot, ORIGINAL OWNERS!" You can't ask for a better location in Orleans! Just within minutes to good schools, parks, transit, HWY 174, shopping etc.. Original owners. Awaiting for your personal touches for some flooring, painting and bathrooms. Spacious layout on both levels: large entrance, separate living and dining room areas, family room with wood burning fireplace. Beautifully remodeled kitchen with lots of counter and cabinet space and eat-in area. 4 excellent size bedrooms on the 2nd level, master bedroom with 3 pc ensuite. Private backyard with patio with gazebo and shed. Driveway 2016, roof, windows, furnace A/C 2006. Hot water tank is owned. Natural gas BBQ (included).